NEW YORK (AP) – Dr. John W.V. Cordice, a surgeon who was part of the medical team that saved Martin Luther King Jr. from a nearly fatal stab wound in 1958, has died at age 95. Sunday’s death was announced by the city agency that oversees Harlem Hospital Center, where Cordice was formerly an attending surgeon and chief of thoracic surgery. Suggested donation: $10 – more if you have it, less if you don’t, no one turned away for lack of funds. Includes lunch, dinner and coffee and tea all day. Open to the public, but only organizations and individuals endorsing the VPA can sponsor and/or present at workshops and panel discussions, display literature and vote on resolutions. What it means to endorse: Supporting the call for a one-day, statewide networking conference of progressive activists under the general theme of Jobs, Peace and Justice. Endorse online at http://www.vapeoplesassembly.org. Note: As much as possible, we will try to include members of various communities in the different workshops and panels. Check back here as the full schedule comes together. Morning: Registration, Opening Plenary Session, workshops and panel discussions. Afternoon: Rally. Keynote speaker: The Rev. William Barber II, President, North Carolina State Conference NAACP and Organizer of the historic Moral Mondays protests at the N.C. Legislature. Followed by more workshops and panel discussions. Final Plenary Session: Voting on Resolutions and the proposed Action Plan. 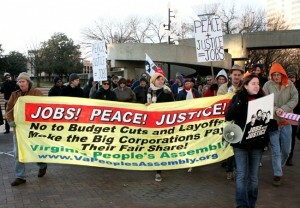 Proposed Action Plan: That we gather in large numbers outside Capitol Square on Wednesday, Jan. 8, the opening day of the 2014 Virginia General Assembly, raising all the issues supported by the VPA and showing a display of united solidarity. And that we then attend committee hearings on bills we are supporting or opposing. Evening Cultural Program: Music, dance, spoken word and more from the many communities represented at the VPA. RALEIGH, NC (AP) — Gov. Pat McCrory and his Republican allies at the legislature have hammered home a simple message about the tax reform package they passed into law earlier this year. On Dec. 18, McCrory said, "North Carolinians will keep more of their hard-earned money thanks to historic tax reform." Who Is Capturing Our History, Black History? I have been doing my very best trying to capture our history at my own expense. I have sacrificed much trying to document our history because it comes with a cost and it is very time consuming. I just don’t understand why there is so much history that goes undocumented in our communities. If we are not going to capture our history who will? Either it will go without being captured or others get to tell our history how they want to and the way they want to. I have refused to allow others to capture our history alone and to tell it the way they want to. I try to be where I can when I can so that I can capture what is going on around us. The local newspapers and television stations don’t always tell the whole story so that is where The DCN Dancy Communications Network comes into play. Are you concerned about our history or are you only concerned during black history month? For me I am concerned every day all day. The DCN has been capturing our history via my blog, video and photos. This comes with a price because it takes equipment and supplies. The DCN make videos possible for viewing on The DCN TV for others to watch for free and post the photos on my blog free also. The DCN can and will capture history via photo and video for you but know that whenever the cameras are rolling it comes with a price. So therefore do not think that in 2014 I owe you something by thinking I am going to provide you a free service while I use my equipment and supplies. I record things but I am not going to give you copies when I am not getting paid to do what I do. If I video things without being paid video copies may or may not be made available until such time I decide to make copies. I am not begging you to use my services or to purchase a DVD from time to time because it does not matter if you hire me to do something for you or if you never purchase a DVD. I capture history for my archives but that do not include going into your archive for free. January 1, 2014 Politics, Social Media And Etc. I will be changing the way I do things when it comes to dealing with issues and people in person, on Facebook and etc. I use Social Media for a real purpose and not to play games. I use Social Media to be educated and to educate as it relates to real issues. I will not continue to waste my time responding to ignance as it relates to Politics unless it is something that just needs to be stated that I know is a lie and that my response will make a deep and immediate impact. I will not be wasting my time responding to ignance that others post or say about President Barack Obama, the Affordable Heath Care and other. I will be posting about how I see local Politics what is happening and what is not happening such as the local Democratic Party and etc. I will continue to video meetings such as the Princeville Town Meetings because it is history the oldest town incorporated by slaves and it should be documented. I have always tried to stay on top of things and by doing such it takes a lot of my money, time and research. I have felt obligated to try to educate those who follow me on my blog as I post about what is going on locally, statewide and nationally. I have spent countless hours blogging during my 30 minutes lunch break every day and every night after I get home from work. By doing the above I will free myself up from some things. So if you don’t see me around or if I go without updating my blog regularly know that I am not gone but just changing the way I do things. My condolences goes out to Anna B. Bynum and the entire family of the late Patricia Hines Hampton Virginia. Consolation game: Greene Central vs SouthWest 3 p.m.
Championship game: Tarboro vs North Edgecombe 6 p.m.
Consolation game: Tarboro vs North Edgecombe 4:30 p.m.
Championship game: Greene Central vs SouthWest 7:30 p.m.